Velka-Sai (Eleonora Giudizi) was born in 1972 in the Etruscan town of Tarquinia, north of Rome, in Italy. She grew up immersed in music, nature and poetry. In her youth, she studied the performing arts, dance and the circus arts, all of which she incorporated into her stage act. For many years, she sang her songs and performed pop/rock on stages up and down Italy. She also had a successful career as a singer/songwriter in Italy and internationally. At a certain point along the way, as a human being and an artist she realized that her path was another. 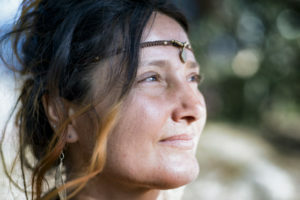 Since then, her vocation has been to use the gift of her voice to touch and heal the souls of the people who hear her, through sound healing, song and the ancestral instruments she plays.